Do u know the real story behind the name "LINKIN PARK"?....i think most of us do...but for the people who dont know, i am posting this....plz read........ In 1996, rapper Mike Shinoda and guitarist Brad Delson graduated from Agoura High School in the Los Angeles suburb of Agoura Hills, California. Upon graduation, they formed a side band with their friend, drummer Rob Bourdon, under the moniker "SuperXero". Previously, Delson and Bourdon were in a band together for about a year called Relative Degree. Delson had also been part of a band called The Pri cks The three members of SuperXero played archaic forms of their music together while at college. Delson attended the University of California, Los Angeles. Shinoda went to the Art Center College of Design in Pasadena, California. While at UCLA, Delson met bassist Dave Farrell. Delson and Farrell were roommates and often practiced and played together. Previously, Farrell used to play in a band called Tasty Snax with Mark Fiore, who later changed their name to "The Snax". Fiore later became Linkin Park's cinematographer. While at the Art Center College of Design, Shinoda met Joe Hahn. Farrell and Hahn later joined SuperXero, and the name was shortened to "Xero". The five men were later joined by lead vocalist Mark Wakefield and, together, they recorded their first, self-titled demo tape. The tape was sent out to various record labels but it was never considered and the band was never signed. Shortly thereafter, Wakefield left the band and became a manager for Taproot. Wakefield left, Shinoda began auditioning for a new vocalist and at the same time Delson began interning for a Warner Bros. Records A&R representative named Jeff Blue as part of his communications degree. Blue alerted Delson and Shinoda to Chester Bennington, a young vocalist from Phoenix, Arizona who was looking to join another band, after being the vocalist for Grey Daze (formerly known as Sean Dowdell and His Friends) from 1993 to 1997. Shinoda and Delson sent Bennington a tape containing instrumentation for a song and he recorded vocals for it. He then called Shinoda and played the song over the phone. This was the start of things to come as the band was instantly impressed by the vocal abilities of Bennington and it did not take long to realize the advantages of his voice and his ability to mould it to be both soft and thought-provoking as well as hard and attention-grabbing. Once Bennington had joined the group, they attempted to have the band signed. Unfortunately, the name was already taken by a 70s and 80s band from Australia so they changed their name to Hybrid Theory and the band's line-up solidified — almost. Farrell temporarily left the band due to previous commitments with The Snax/Tasty Snax and, as such, wasn't able to record bass for their first, self-titled EP. Instead, Delson and a bassist named Kyle Christner played bass. Released in mid-1999, only one thousand copies of Hybrid Theory EP were pressed. Several copies were sent to various record labels, including Warner Bros. Records. The rest of the copies were given to early members of the band's newly formed street team. Farrell was temporarily replaced by Scott Koziol. Scott appears in the video for "One Step Closer" from the Hybrid Theory album. The band was subsequently signed to Warner Bros. Records in 1999 thanks to Blue. However, they were forced to change their name again due to a trademark issue with a British electronic group called Hybrid. There were several suggestions for the bands new name, including Clear, Probing Lagers, Ten P.M. Stocker (an inside joke for the band since they were always recording and practicing material late at night). When the band was creating Hybrid Theory they used to park their cars outside and there was a time limit, 1 am, until which they could park. As Bennington said, "We've probably spent more money on parking tickets than Warner Bros. makes annually! "Bennington eventually suggested the use of the name "Lincoln Park" because he would drive by it in Santa Monica, California (now known as Christine Reed Park). He drove past the park on his way to the recording studio every day when the band was recording demos for its debut album. Bennington thought that since there are Lincoln Parks all over the country, the band would be recognized as a local band no matter where they went. He also liked the name because it had no meaning, allowing the music to describe itself. The group bore the name Lincoln Park for a few months, but when they decided to register a domain name, they found that "lincolnpark.com" was already taken. 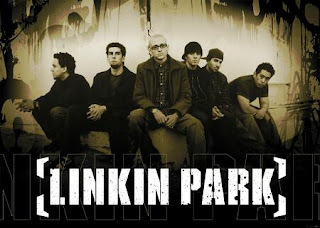 Because the band couldn't afford to purchase it, they simply changed the spelling from "Lincoln" to "Linkin" and purchased the domain name "linkinpark.com".